December 14, 2015 – The conservation achievements and leadership of Dr. Lex Blood and Mike Conner were recognized at the FLT holiday party and membership meeting on Thursday, December 3rd with the Flathead Land Trust Leadership Award. 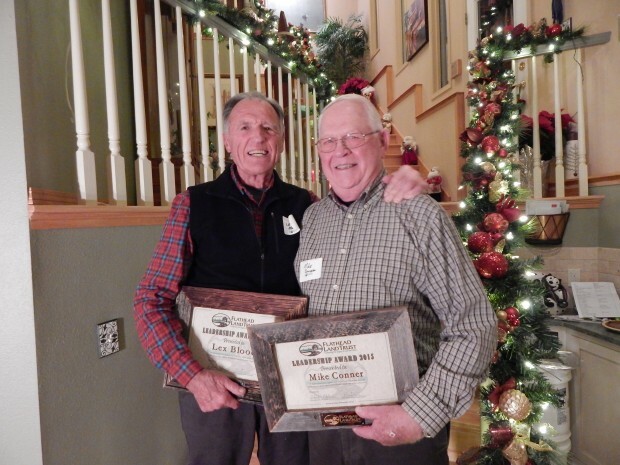 This is the second year the award has been given to recognize the conservation achievements, leadership, and incredible volunteer service individuals have given to the community through their work with Flathead Land Trust. Mike Conner led a distinguished career with the Forest Service over many years. While at the Flathead National Forest in the early 1980’s, he was approached to help develop a conservation easement donation program and to partner with a private nonprofit organization to help implement this relatively new concept. Because of Mike’s efforts and the momentum that he helped to create, the idea of a local land trust caught on the Flathead which resulted in the formation of the Flathead Land Trust in April, 1985. Mike has played just about every role in the organization, from advisor and member of the advisory board for many years, to even time as an executive director. We are very fortunate that he continues to lend his knowledge and leadership to the organization and our conservation efforts which he was instrumental in getting started. Dr. Lex Blood is a trained geologist, long-time Flathead educator, and a leader and invigorator of conservation efforts across the Flathead for many years. Lex retired from a distinguished teaching career as a Geology/ Geography/Earth Science instructor at Flathead valley Community College, and an adjunct professor of Natural Resources at the University of Montana. He was co-founder, president emeritus, executive director, and instructor for the Glacier Institute and is the founder of the Crown of the Continent Ecosystem Education Consortium (COCEEC). He also began the Flathead Nonprofit Development Partnership and is the managing director for The Sustainability Fund which offers grant funding to sustain nonprofit and conservation efforts throughout northwest Montana. Lex continues to be very active in conservation and educational efforts in the Flathead, giving his knowledge and leadership experience to numerous organizations, consortiums, and institutes. He also continues his work as a geologic consultant with Flathead Land Trust. His leadership, involvement, generous financial support through the Sustainability Fund, and desire to see this local land trust achieve its mission and goals are big reasons why we can celebrate much of the conservation work that has been accomplished over the years throughout northwest Montana.